In 1933 Hungary looked twords Germany for direction, Hitler was chancellor. The Trianon Peace Treaty saw Hungary lose two thirds of its territory and up 60% of its population. 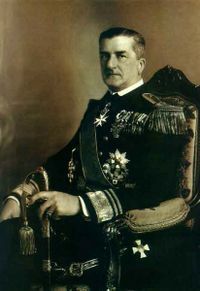 In 1920 Admiral Miklos Horthy was elected regent of Hungary, and because of his political allegiances Germany became Hungarys most important trading partner. In 1938 Hungary regained a section of the lost territories, however in return an agreement to economic and political concessions was conceded. In 1939 Pal Teleki came to power. With regards to Germany he was a very critical prime minister. Horthy decided going to war on Hitler´s side. In protest, Teleki commited suicide. In June 1941 Hungary declared war on the Soviet Union.